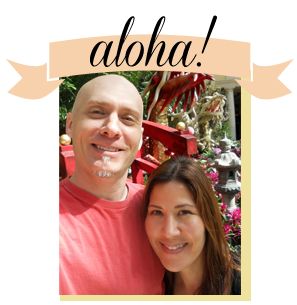 We love this photo our clients Danielle and Tom sent in yesterday for our Ohana album on cakelava.com. 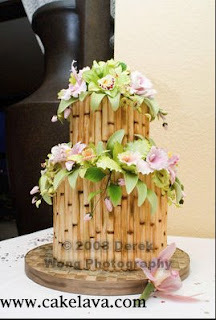 We made our signature all-bamboo wedding cake for their May 24th wedding. From the first time I spoke on the phone to Danielle, she had a warm and gracious manner and enthusiasm for every part of her wedding. I knew she would have a fabulous time in Hawaii! 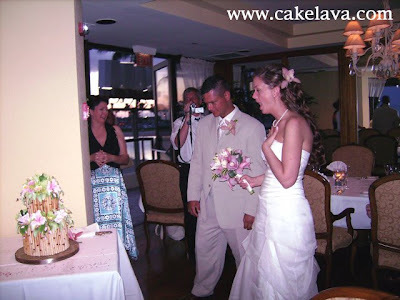 I just wanted to let you and Rick know that I am so grateful for our cake and for all your help with the wedding plans. People are still talking about how incredible the cake was and how fantastic it tasted. I have pictures of my first reaction to the cake and I have been asking my sister-in-law to forward to me for awhile now. It’s priceless. When I first seen the cake it took my breath away. I must have stared at it all night. It’s the first thing I show people when I show them my photos. I loved it!!!! Thanks again. Working with you and Tom has been such a treat for Rick and I! 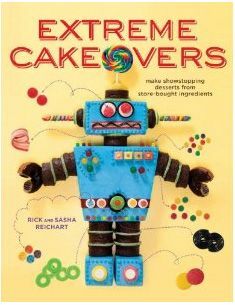 We love your enthusiasm for our cakes and your high-level of energy. You really embrace life and adventure! With all our Best! This cakes looks amazing. Is this actual bamboo on the outside deco or is frosting that looks like it?